A Chicago mother is still looking for answers seven months after her 19-year-old son was shot dead by police officers on the city’s West Side, and she has filed a federal wrongful death lawsuit claiming that her son was killed without justification, the Chicago Tribune reports. According to the news site, Roshad McIntosh’s mother, Cynthia Lane, still does not know a single thing about the investigation or what happened to her son. She doesn’t know the names of the officers who killed him or whether they’ve even been disciplined for the shooting. 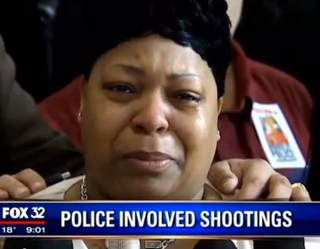 She doesn’t know why her son was being chased that fateful Aug. 25, 2014, night. Some witnesses at the scene had claimed that the teen was surrendering when he was shot, but Lane has not been able to find out anything about that, either. “I would just like to know why, why did they shoot my son?” Lane said to reporters at the Dirksen U.S. Courthouse as her lawsuit was announced. The lawsuit claims that McIntosh was killed without justification and that police have since worked to cover it up. According to the lawsuit, the teen was “enjoying a summer evening” on the West Side when he was approached by officers who had their weapons drawn and began chasing him. McIntosh, whom the lawsuit said was unarmed, tried to surrender, but officers allegedly opened fire, “killing him without cause or provocation,” according to the lawsuit, the Tribune notes. Police, however, insist that when they spotted individuals who fit the description of armed suspects, one of them—later identified as McIntosh—took off running before he allegedly drew a weapon and did not heed orders to drop it. “The offender then … pointed his weapon in the direction of the officer,” the police statement read. “You got an offender with a gun. Instead of dropping the gun and surrendering, he points the gun at the police, and the officer has no choice,” police-union spokesman Pat Camden said, according to the Tribune. Police, he said, did recover a handgun at the scene. Lane, the Tribune notes, is now left to raise her 3-year-old grandson, who will never know his father. “He gives me the strength to keep fighting and to try to get justice,” the grieving mother said of her grandson. According to the Tribune, the lawsuit also accuses the Chicago Police Department of civil rights violations, slamming practices that it says leaves black men as targets and adheres to a “police code of silence” toward the investigation and discipline of fellow officers.